Creek, and Ward Lake! During his visit the school students, teachers, and visitors enjoyed a lunch menu inspired by his mother – hotdogs, chips, and popsicles. 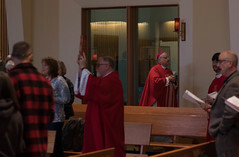 We look forward to welcoming him again this spring for Confirmation! Metlakatla parishioners exchange the Sign of Peace. Family Mission in Metlakatla, there is no physical structure. This autumn we have been delighted to gather for Holy Mass in the meeting room of the Metlakatla Inn! Father Pat Travers has been able to travel over on a regular basis. We look forward to developing a stronger bond with our neighbors over at the “Saltwater Pass.” A big nt’oyaxsn and dogedinh to Lori Christiansen for always feeding the troops and preparing our space! this analogy as an invitation to examine not just where we are in our year, but in our lives. Where were we last year? Are we looking up to that landing? Or are we looking at it from a higher rung? He also offered a history of Christianity in Alaska, starting with the Russians, and took us on a journey to see ourselves not just as an end product but as active missionaries in a missionary land. The youth group at Holy Name has been very active this autumn! In addition to a robust cadre of “usual suspects” we have been blessed to see many new faces and hope to see them more and more throughout the school year! Our biggest hit was, without a doubt, the youth lock-in held right before Christmas. The youth were given a blessed evening of faith, fun, and food! 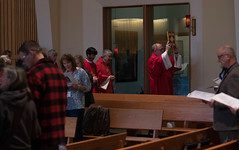 In addition to the compulsory pizza, sodas, and group games we were also delighted to attend a special late night Mass and to recite the Liturgy of the Hours. A chaperone supervises the White Elephant gift exchange at the Lock In. We have also been on a garage sale streak lately! Due to the generosity of the community, we had to have another yard sale to free up our youth lounge for use. The youth acted with great maturity, politely helping shoppers and keeping the area well organized. But it is not just all about us! The youth group has been going to the Pioneer’s Home on a monthly basis to spend time playing games with the residents. Some are even parishioners and are particularly excited when we show up! We hope that this will be a permanent addition to the youth group’s activities. What does the future hold in store for Holy Name? This spring we will be celebrating First Communion & Reconciliation for some of our younger parishioners, while others will be receiving the Sacrament of Confirmation. We look forward to making strides over at Metlakatla and providing more resources for the Catholics there. The youth group has many more meetings and service opportunities to look forward to, as well as a summer excursion (to be determined). We also look forward to welcoming a service group from St. Vincent’s College again this coming summer. That’s the news from Ketchikan.